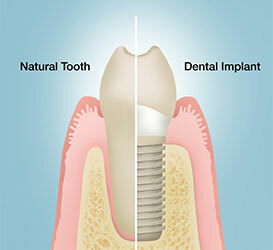 Dental implants can replace any or all of your teeth. The implant becomes integrated with the bone and acts like a "root" which will ultimately support a new tooth. 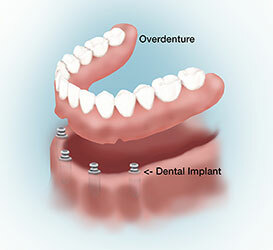 Implants can also be used to support and hold in a loose denture. The advantages of implants for patients with dentures are: denture stability, increased patient comfort and confidence. 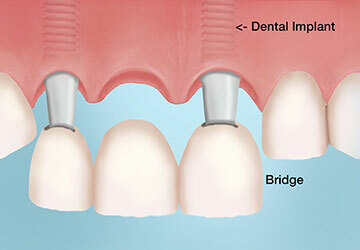 When replacing a single tooth, implants allow us to avoid involving adjacent teeth in a fixed bridge replacement. Implant supported teeth have actually been shown to last longer than other forms of tooth replacement. Implants represent a longer and more natural solution than dentures, partials and even fixed bridgework. If you follow a regular routine of dental care and oral hygiene, they should last for many years, particularly if you have an "ideal" case. Independent surveys of implant patients show that they felt the investment was worth every penny and would do it again! 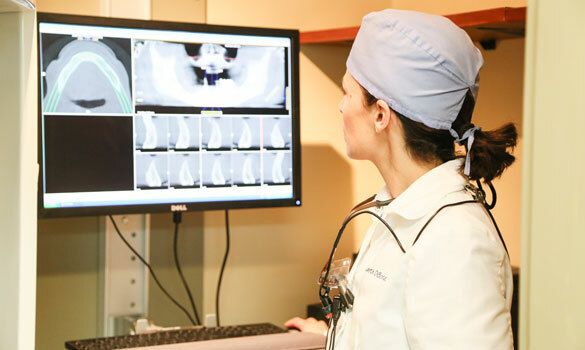 Dr. Elizabeth DiBona uses 3D imaging software to analyze the width of bone prior to placing a dental implant. The 3D scans are done right in our office. Why Choose DiBona Dental Group? We offer both the surgical and restorative part of dental implants all in the comfort of one office. This means you can get the implant, and the crown all without having to travel to different offices. The DiBona Dental Group has extensive training in both the placement and the restoration of dental implants. Dr. Elizabeth DiBona has reached the status of Fellow of the International Congress of Oral Implantologists, as well as attained Associate Fellow status of the American Academy of Implant Dentistry. These titles are achieved by experienced dental surgeons who pass written and oral exams, as well as present numerous implant cases to a panel at the AAID in Chicago. Similarly Dr. Mark DiBona has attained Diplomate status from the American Board of Oral Implantology/Implant Dentistry and the International College of Oral Implantologists, Fellowship in the International College of Oral Implantologists, and Fellowship in the American Academy of Implant Dentistry. Dr. Mark DiBona has placed thousands of dental implants in the past 40 years. We believe that implants are the "standard of care" for the replacement of teeth. They are cost effective and have a better long-term survival rate than many alternative treatments, such as root canals and conventional bridges. For additional information, please visit the American Academy of Implant Dentistry at www.aaid-implant.org or the International College of Oral Implantologists at www.icoi.org.